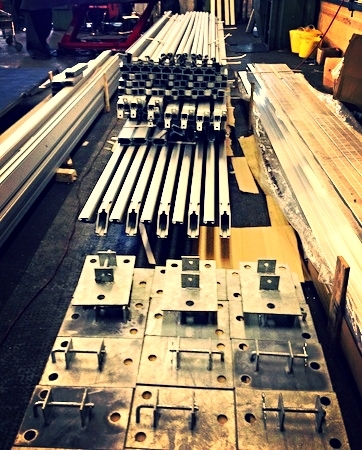 Marquee Components Range — Marquee manufacturer and temporary structure sales. Shield offers high quality marquee components for clear span structures. We can also make custom parts for you. When you buy Shield's equipment, we're certain it's going to last you a long time and not cause any issues, so you won't have to worry about the replacements or repairs. However, you might have had some older stock that got worn out and needs a replacement. But just one item (ok, maybe few items) - not all of the other components, nor the PVC covers, all of which were designed to work with a certain system in mind. CMS structures are extremely versatile - you can see them as building blocks, which you can mix and match. A standard CMS-type structures are available in 3m, 6m, 9m, 12m and 15m sections. With a 3m bay length, you can use as many bay sections to extend the construction to any size required. Shield's leg shaft in inventory at Crest Marquees Ltd. marquee hire company in Birmingham, UK. The core of our framework is built from the high quality aluminium extrusions. The alloy we use is Al 6082 T6, renown for it's strength - and there for used in many stress-critical applications. We carefully cut it and CNC it at our Birmingham facility, ensuring great fit and finish. You can rest assured - all of our steel parts, from the smallest items up to the large knuckles are made from hot dipped galvanised steel. Your Shield knuckle will withstand a long time of use under adverse weather conditions. 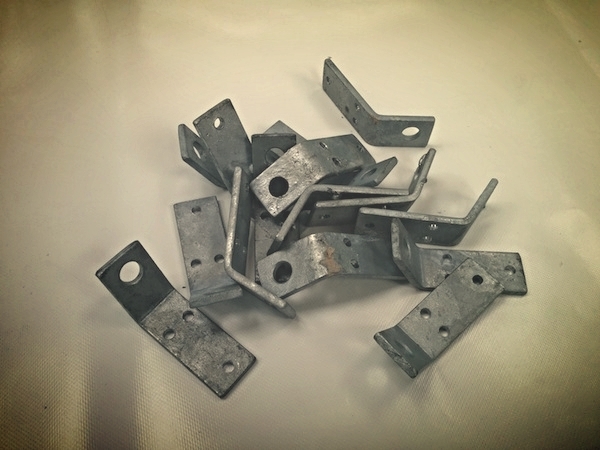 Shield's first ever batch of galvanised footplates (Item code: CF-FTPT2) in 2013. Once completed, all of our items undergo a quality control stage: basically, all parts are tested and compared against our reference designs, to ensure everything fits perfectly without imperfections and undergoes a cleaning stage. Once completed, items are put into stock, where they usually stay until the delivery. Some of the finer parts can additionally be covered to preserve the finish (like the aluminium parts after they've been anodised). Shield's CMS Roof Knuckles (Item code: CF-RKN114) for the 114mm Profile Structures. For select metalwork components, Shield has a limited stock availability - so it's always better to inquire. Recently, however, we been trying hard to make the turn around time lower. Long story short - you will not have to wait a year for your order, but it is obviously subject to the size of the order and any other customisations you want. We would recommend to allow 2 weeks minimum for out of stock items.